Grab documents, programs, videos, music and compress files quickly with powerful download manager. EagleGet will split target files into several pieces to catch files with higher speed and multi thread technology. The acceleration in speed does not matter of HTTP, HTTP or FTP servers. Splitting the files into specified parts while downloading and merging them at finishing point is the class of EagleGet. Enhancement in commonly using web browsers including Chrome, Firefox, Opera and IE is already fixed. EagleGet is advanced featured application that supports multiple queue downloading with ease and access. It makes it possible to find media content automatically from anytype of website. The auto browser integration will help EagleGet to start realtime monitoring of media files. However, some of advanced features such as file integrity verification and malware scanning system will makes it lovable. These features will prevent data and privacy from unknown hands as well as ensuring to download genuine files. Advanced multi threading technology brings several ways to find, detect and start downloading files instantly. Furthermore, resuming corrupted, broken, power lost, connection disconnected and unexpected shutdown downloads. The developer has added some new features for latest versions of different internet browsers. Download Accelerator Plus and Internet Download Managers are rich featured and top ranked download managers that may cost high price for commercial usage. However, EagleGet is light weight, fast and responsive application that is simple to use. 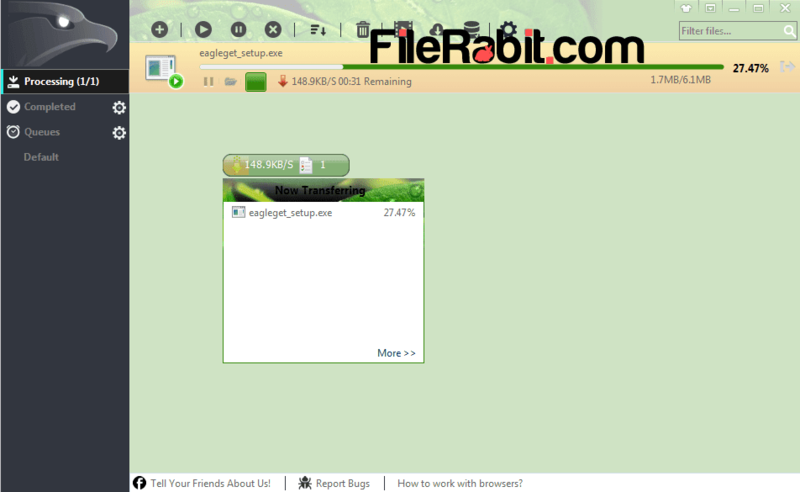 Download anytype of audio, video, document, archive or program file with few steps. Drag & drop files with rearrange numbering of files in priority list. Media converting feature available for multimedia files that will convert videos on user demands. Start multiple downloads at once, give sleep, hibernate or shut down command to computer upon finishing downloads. System tray icon will show each notification to user but in Silent (Gamer) mode, it shall not display any notifications.